Repetitive Transcranial Magnetic Stimulation (rTMS) is a form of deep brain stimulation approved by NICE (National Institute for Health Care and Excellence) in 2015 as a particularly powerful method of treatment for depression. It has also been successful in the treatment of a number of other disorders such as chronic pain, migraine, tinnitus, eating disorders, and addiction. TMS Therapy is entirely non-invasive and has few side effects. It doesn’t involve any anaesthesia, surgery or oral medication. The session involves placing a treatment coil on the skull next to the area of the brain most associated with controlling the medical or psychiatric condition being treated. A magnetic pulse will be passed through your skull into your brain which creates a small electric current and in turn stimulates neurons to become more active through a process called electromagnetic induction. The treatment is administered by Consultant Psychiatrist Dr. Sarkhel who specialises in Mental Health and has had over 25 years experience in the field. To find out more information please refer to our frequently asked questions. rTMS involves placing a treatment coil on the skull next to the area of the brain most associated with controlling the medical or psychiatric condition being treated. Unlike electroconvulsive therapy (ECT), rTMS is painless and does not affect the whole brain. rTMS works by inducing small electrical currents into the brain using pulsing magnetic fields. By controlling these currents we can increase or decrease activity in the parts of the brain associated with the condition being treated. The treatment usually takes 2-6 weeks to complete with most recipients feeling a noticeable effect after 3-4 weeks. If you’re interested in receiving treatment but you’re not sure if it is the right option for you, schedule a no obligation call with Dr. Sarkhel to determine your suitability. Dr. Sarkhel who administers the treatment has over 25 years experience within the mental health sector and has specialist training in administering TMS treatment. The side effects from TMS are incredibly small compared to those from traditional pharmaceutical anti-depressant medications. The most common side effect reported is a headache, but not everybody will experience these. TMS treatment is incredibly comfortable and simple, there is no need for anaesthetic during this treatment. You won’t even feel any pain and can even read a book or magazine whilst being given treatment. There can be many reasons why somebody may prefer a drug free option. Those who cannot tolerate the side effects of traditional medications tend to find this treatment particularly helpful. We are unique in the sense that we administer a range of bespoke complementary and holistic therapies alongside TMS treatment in an approach we call ‘Integrated TMS’. At Living Mind we realise the benefits of integrated healthcare. 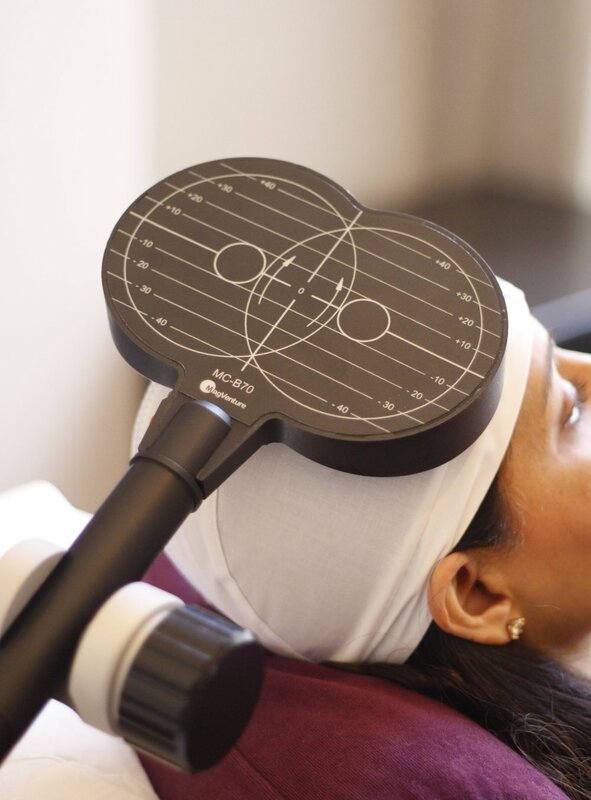 We offer mindfulness and talking therapy alongside traditional TMS treatment as we believe an integrated approach will optimise your results and improve your outcome. rTMS is seen in the medical world as a groundbreaking drug-free treatment for depression. Many sufferers of depression turn to rTMS if they want to take a non-pharmaceutical approach to treating depression and also want to avoid the notable side effects of taking antidepressants. It is a useful treatment for those who have failed to respond to antidepressant medications. Integrated TMS, has been proven to help alleviate the symptoms of not only Depression, but numerous other conditions such as physical migraines, lower back pain, tinnitus, post stroke neuropathic pain, and other chronic pain conditions. It can also help with PTSD, alcohol, and addiction in many forms. For more information, please visit our frequently asked questions page. There is not currently any medicine to treat addiction to cocaine, but rTMS has shown promising results in treating this condition. One particular study showed that out of thirteen test studies who received rTMS treatment for cocaine addiction, ten showed favourable results with reduced drug use and cravings for the drug. If you are interested in receiving rTMS for a physical disorder such as migraines or chronic pain, a written assessment by a GP or specialist physician will be sufficient and we will not require a written psychological or psychiatric assessment. Migraine is an intense headache which comes along with numerous side effects including sensory disturbances, nausea, and vomiting. In January 2014, the National Institute for Health and Care Excellence (NICE) approved the use of transcranial magnetic stimulation (TMS) for the treatment and prevention of migraine. Numerous clinical trials have supported the administration of rTMS for migraine, showing that the treatment can be used in 2 different ways for those suffering with migraines. Either when the migrate starts to reduce the severity, or regular treatment to prevent the frequency of the migraines.